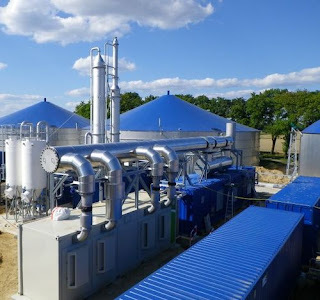 In the north of the Franche-Comté region, on the Swiss border, a newly installed biogas and biomethane production plant went operational on August 5th, supplying biomethane to the French natural gas grid at a rate of 70 standard m3/h. The biomethane is processed from 6,000 t a year of agricultural waste, such as cattle manure, pig manure, intertillage and starch. These are digested in a stainless steel fermenter with a capacity of about 1,500 m3. To ensure effective biogas processing, German plant manufacturer WELTEC BIOPOWER decided to deploy flexible, compact membrane technology. In the three-stage separation procedure, methane is separated from carbon dioxide (CO2), water vapor and other components with the help of special polymer membranes. The WELTEC membrane procedure delivers a methane yield of about 99 percent. Weltec advises: “The upstream compression is another advantage of the procedure. In this way, the separated methane already has the needed pressure for feed-in to the natural gas grid without being compressed again. This saves costs by eliminating the need for an additional compressor and enables economic use of WELTEC biogas processing even for smaller plants. French agriculture has a wealth of raw and waste materials that are suitable for biogas plants. However, only half of the available materials are presently used for energy production. Thus, ambitious development plans have been drawn up: by 2020, the biomass share in the field of renewable energies in France is to rise to about 50 percent.